Challenges with clinical guidelines documents such as information overload, varied implementation and difficulty to maintain led this leading healthcare provider to adopt a new approach using decision modeling to develop clinical decision services. 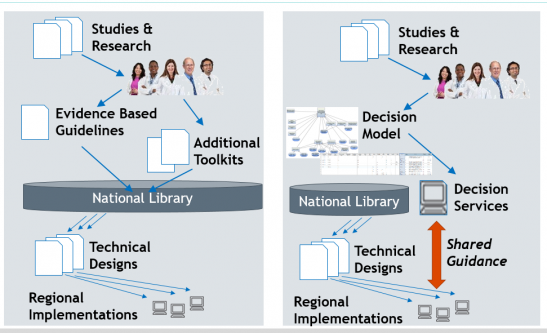 With a decision management approach, the studies and research available could be combined into a single decision model. This could then be used to deploy some standard decision services, available on the enterprise infrastructure, to make decisions whenever and wherever needed. The organization is a not-for-profit health plan providing a wide range of services, including inpatient, home health, hospitals, hospice, pharmacy, and insurance. 10M+ members, 17,000 doctors and nearly 200,000 total employees. Run discovery workshops involving actual business owners – in this case, heart surgeons and heart transplant specialists –to describe the decisions involved and their business context. Model and refine decision models in DecisionsFirst Modeler, our decision modeling software. This revealed more granular and reusable decisions as well as the input data and knowledge sources involved. Transform decision models into executable decision tables. As the model stabilized, decision tables were added to IBM’s Operational Decision Manager BRMS using the web-based editor and each table was linked to a specific decision in the decision model using our integration between DecisionsFirst Modeler and IBM ODM. Deploy an ODM Decision Service that could be called from processes or from a UI such as that used by the Doctors. The methodology is available from Decision Management Solutions and is configured to fit with an organization’s other approaches based on experience with a decision modeling effort running in parallel.